Zappos.com is a top choice for shoes, clothing, bags, and other everyday essentials for men, women, and kids. Thanks to over 1000 trusted brand names like Nike, The North Face, Clarks, UGG, and Coach, we’re able to help millions of customers create a long-lasting wardrobe they’ll love. Plus, all Zappos customers enjoy Fast, Free Shipping, Free & Easy Returns, Friendly Customer Service, and a 365-Day Return Policy. •	The Zappos.com Gift Card ("Gift Card") and Zappos.com e-Gift Certificate ("e-Gift Certificate") can only be used online at Zappos.com. •	Please treat Gift Cards and e-Gift Certificates like cash. Gift Cards and e-Gift Certificates will not be replaced or refunded if lost or stolen. Zappos.com is not responsible for lost Gift Cards or e-Gift Certificates. •	Gift Cards and e-Gift Certificates will not be returnable or exchangeable for cash, except in states where required by law. •	Coupons and other discounts may not be used to purchase Gift Cards or e-Gift Certificates. •	A Gift Card or e-Gift Certificate cannot be used to purchase Gift Cards or e-Gift Certificates. •	Purchase amounts that exceed the value of the tendered Gift Card or e-Gift Certificate will require a credit card for the balance due. 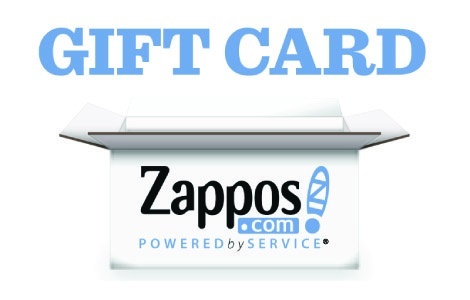 •	Zappos.com Gift Cards and e-Gift Certificates do not expire and we do not assess any service fees for non-use. •	Your purchase or use of a Gift Card or e-Gift Certificate constitutes acceptance of these Terms and Conditions. These Terms and Conditions are subject to change without notice.